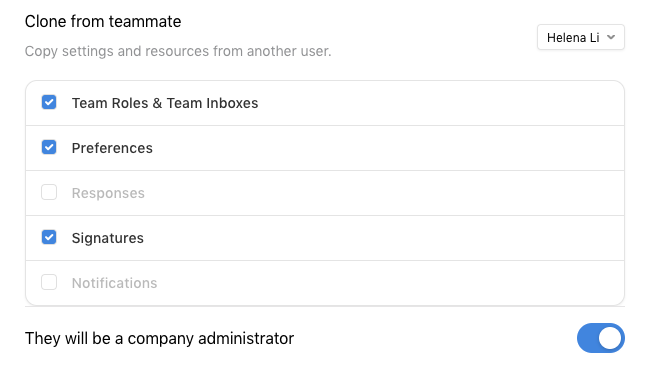 When Front admins invite a new teammate, they are able to clone a subset of settings from an existing teammate. The selected settings and resources will be inherited by the newly invited teammate to give them a head start on setup. 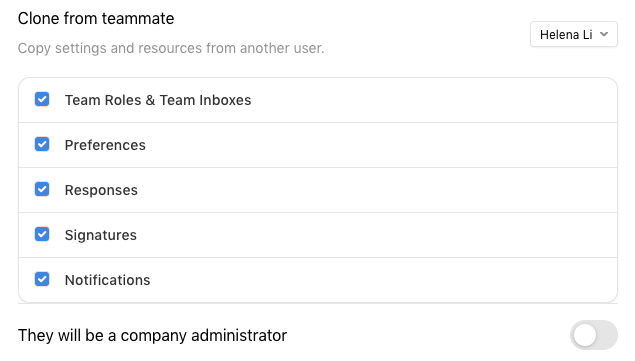 With this template of settings from the existing teammate, admins can then quickly make specific changes to the teammate's settings, without needing to manually create each setting such as shared inbox access, signatures, responses, and more. The feature is helpful for setting up a large number of users who have the same or similar preferences. In general, all team inbox access and most individual settings are cloned from the existing teammate. You can select and unselect any category. All Teams and shared inboxes are cloned. All individual signatures are cloned. Any advanced notification references to individual inboxes. For instance, if an existing teammate has an advanced notification rule that refers to both an individual inbox and a team inbox, the cloning will inherit the team inbox and not the private inbox part of the rule. Even though these categories are not cloned, admins can still manage individual inboxes and individual rules for the teammate on the teammates' settings page. If a teammate already exists and has settings, you cannot use the clone feature to override their settings. This feature is only for new teammates. 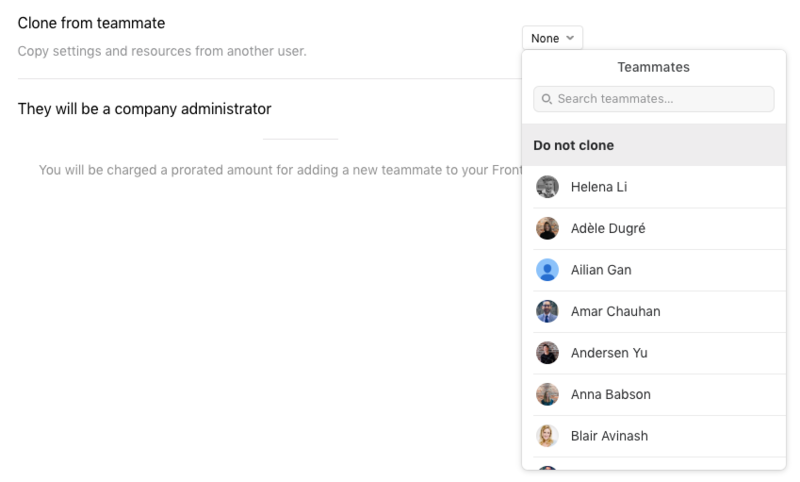 If an admin invites a new teammate by cloning at the Team level and not at the Company level, then the new teammate will only get access to inboxes within that one Team, even if the existing teammate being cloned from has access to other inboxes. For example, if existing Teammate A has access to Team 1 and Team 2, and the admin clones new Teammate B at the Team 1 level, then Teammate B will only have access to Team 1 and not Team 2. When you invite a new teammate by cloning at the Company level, the new teammate will inherit the roles of the existing teammate. 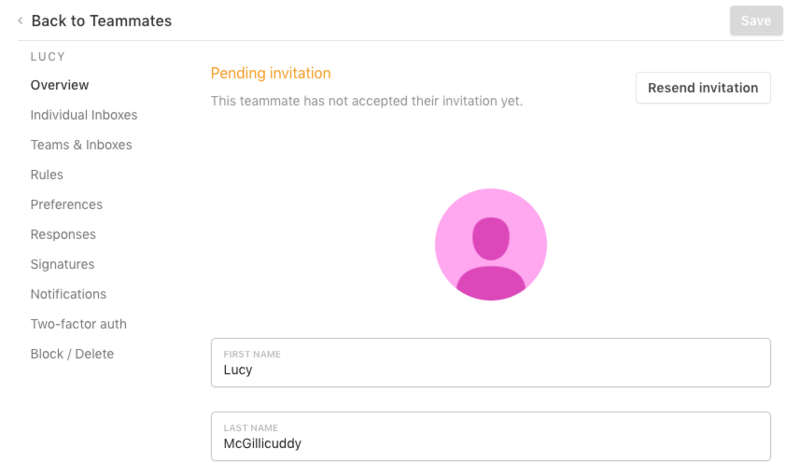 You cannot edit the roles until the invite is sent. When you invite a new teammate by cloning from the Team level, you can choose to give the new teammate a different role from the existing teammate at the cloning step. Click into Settings, and Teammates under the Company section or the specific Team you want to add the teammate into. Fill in the email, first name, and last name of the new teammate. In the section Clone from teammate, choose the existing teammate you want to clone from. By default, all categories are selected to clone from (see above section for the specifics of what is cloned in each category). Unselect any categories you do not want to clone. You will land on the teammate settings page. Check through the categories on the left to ensure the settings are what you expect. If you want to customize any non-cloned settings such as individual inboxes and rules for the teammate, you can do so here.